Normally I would do product reviews on my Dale's Wargames blog, but as this product is related to my Wooden Warriors I put it here. Once upon a time I used steel bases for my miniatures and laid magnetic sheets down in boxes for storage. It was after basing a Philistine DBA army, and being so proud of the basing, that I realized that the 40mm x 40mm chariot base I had used was not actually 40mm square. In fact, as I lined up the army I noticed that a number of bases were off by a few millimeters here and there, and sometime not even squared. It was at that point I stopped using steel bases. 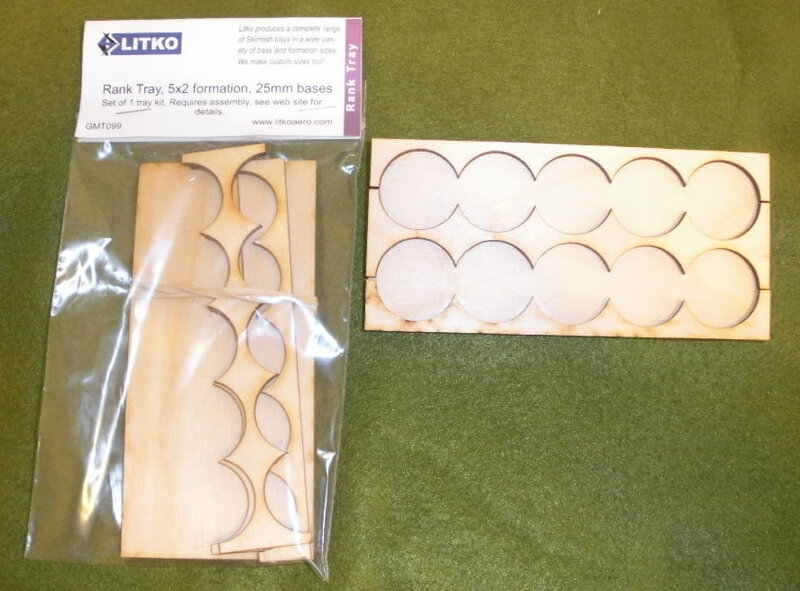 So, casting about for a replacement I decided to try Litko's laser-cut wooden bases. I those the thickest ones, so my fat fingers can grip them rather than the miniatures, and I never looked back. That is all I use for DBA or other similar games. For my wooden warriors I have been mounting them on round 1" discs (1 1/2" for mounted figures) and it suits my purposes for skirmish games. But, my final goal is to be able to use these for mass games too, so I've been casting about for movement trays. I had seen Litko's skirmish trays, but it wasn't quite what I was looking for. Then they came out with the horde trays, but again, not quite what I wanted. Recently (or at least recently known to me) Litko released rank movement trays, which looked to be exactly what I wanted. These allowed me to line them up nice and neat. A single tray is $4, so it is not a "budget wargaming" item, but I wanted to experiment with the concept to see if I wanted to try and build my own. Here is the package you get, along with one built in a standard way. 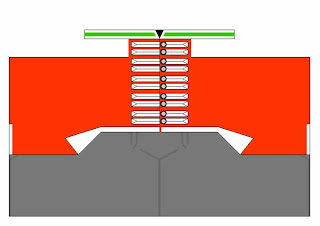 There are four pieces for a two-rank tray: the bottom, the front and back cut-outs, and a center cut-out. If you order three- or four-rank trays you get an additional center cut-out for each rank; a one-rank tray has not center cut-out included. Gluing these together is relatively simple, but unless you use a very quick-bonding glue, you will need to clamp the pieces. As it was, one of the packages I purchased had a warp in the bottom board, so wetting the board a bit and clamping it helps take that out. I used white glue with a couple of dots of Gorilla Glue Super Glue. I should have used wood glue, for a better bond and a water-resistant finish. One major point: 25mm is not the same as 1", when you are dealing with the tolerances of a laser-cutter. I had to sand down the edges of the 1" bases to get them to fit in properly. I tried two experiments. As my figure's bases have magnetic sheet on the bottom, I wanted them to stick securely in the tray. The first experiment was putting magnetic sheet across the whole of the bottom wooden base before gluing on the top cut-outs. This worked, but not as well as I hoped. Magnetic sheets do not stick well to other magnetic sheets, but prefer metal. The second experiment was to glue a metal sheet to the bottom wooden base before gluing on the top cut-outs. This worked fine, but cutting metal sheets to an exacting size is not easy. But the hold was of the strength I wanted while the magnetic sheets were not, so metal sheets it is. Here are the boys in their new trays. Now, all I have to do is get the trays exactly the size I want. 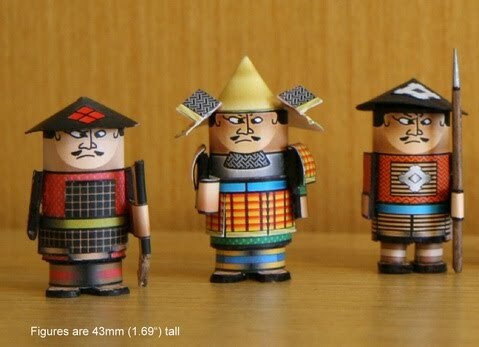 These are 5 figures wide by 1, 2, 3, or 4 ranks deep, but I want them in 3-figure wide sizes with 1" (not 25mm) holes and I want two 1-rank bases to be the same depth as 1 2-rank base. I may have to email Jim at Litko and see what it will cost. In the end I will probably have to find a cheaper method of building these myself. I knew I should have bought that laser-cutter a year ago, when I was thinking about it! After some discussion on the Wargaming on a Budget forum, I decided that the next experiment would be a "full" body" print - or as close to full as I could get it. I started with this drawing. I cut along the black lines for the coat, stopping at the lace on the chest. I also cut along the bottom of the collar, again stopping about where the chest lace extends. The idea was that I could wrap each section separately. This drawing clearly shows that I do not know how to deal with 3D shapes as the section for the top of the coat - which is to go in the shoulder area - will never work. Nonetheless, I printed this version and an uncolored version out (the latter so I could draw on it and determine where other details should be drawn) and glued it on a figure. It actually did not look half bad for the portion below the shoulders. My second attempt is more of an acknowledgement that I am not going to get the curved shoulders right anytime soon, so I just removed it. I also added some details, like the lines to define the legs, access panel for the trousers, turnbacks for the coat and changing the shape of the coat. I am taking a break at the moment, but I think this second one will wrap around the pawn better than the first. I have found that putting the heart on the bottom of the pawn - the feet, which also act as a platform for building the shoes up with modeling material - before gluing on the paper makes it easier to line up the cut-out onto the figure than if you glue it on before the feet. You definitely do not want to build up the modeling material, however, until after the paper is glued on as you would just have to cut out the area for the shoe if you put them on first. So, as I had a few infantry figures lying around (experiments with using 3/4" Heart shapes and Das modeling clay for the feet), I decided to try printing out the lace, cross belts, shoulder straps, etc. 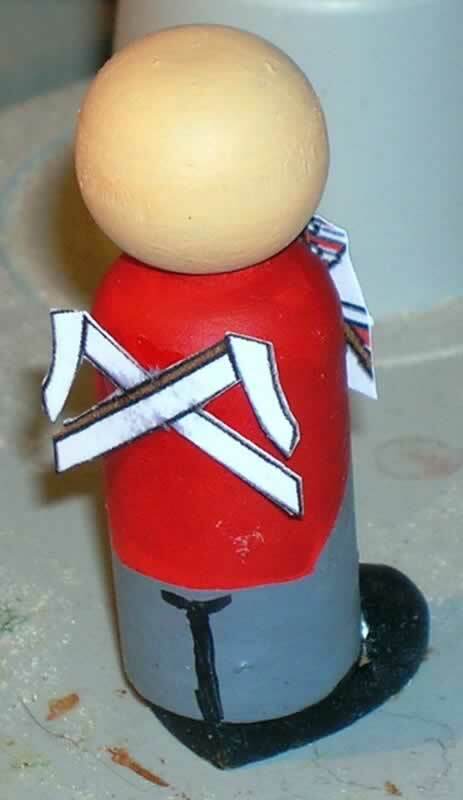 for a British Line figure, glue it to the figure, touch it up with paint, and see what the result was. I started with a basic figure (below left) and painted the basic colors onto the figure (below center and right). That white goop on the top of the shoes is Das modeling clay. I found that it does not stick to wood any better than Crayola Modeling Magic Fusion, but is more solid after drying. It is messier, however. I started with an image of the chest lace, etc. of the British Line, measured the dimensions on the wooden model, then resized the image appropriately. Because the image will wrap around the figure, the image needs to stretch horizontally more than vertically. This distorts the image to some degree, but it creates an exaggerated look that works for these figures. The image, front and back, is shown in the figure below left. I then cut out and tacked the printing to the figure with a small dot of super glue (below center and right). Once the center is down firmly you can glue one side of the printing down with white glue and hold it in place until the glue hardens (which is fairly quickly, due to the heat from your fingers). Once one side is down, glue the other down. You may need to make notches in the paper to remove any wrinkles. 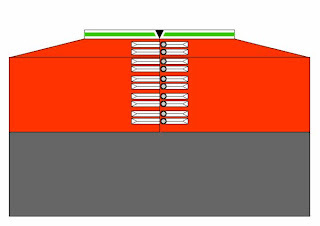 As the front and backs do not touch, you need to add paint for the belts to "meet in the middle". In this case I have to match up the shoulder straps, cross belts, and the canteen strap. 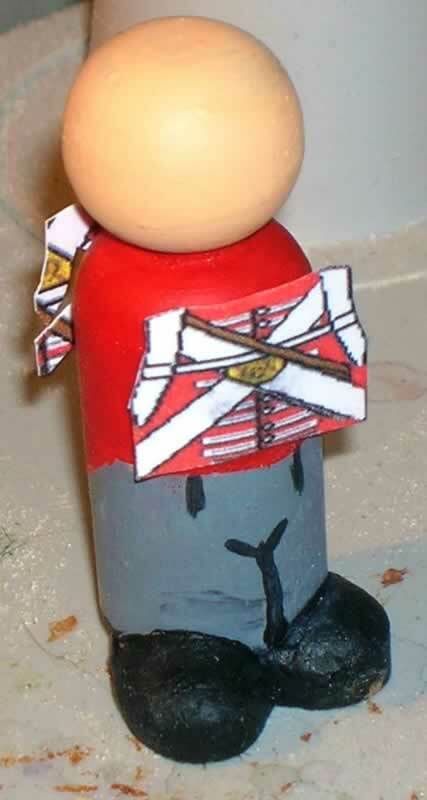 While you are at it, you can touch up the edges with paint, cover the glue spots, and so on. This figure, once assembled, took less than 20 minutes to paint to get to this point. At this point I would add the arms, paint them in basic colors, and then glue a printing of the cuffs and lace on the arm. To attach the arms you sand a flat spot on the sides of the figure to increase the contact surface for gluing, and use the super glue/white glue combination mentioned in previous blog entries. First let me state that the photographs show more detail and color variation than is easily seen with the naked eye viewed from about 3' away. (That's another way of saying it looks worse in the close-ups than in person.) That said, I am please with the result, as it brings the level of detail that I want while being fast. Gluing is a bit fiddly, but the time-savings makes it worth it. As this was an experiment, I wasn't too concerned about color matching or fuzzy details. Future versions will be more precise. 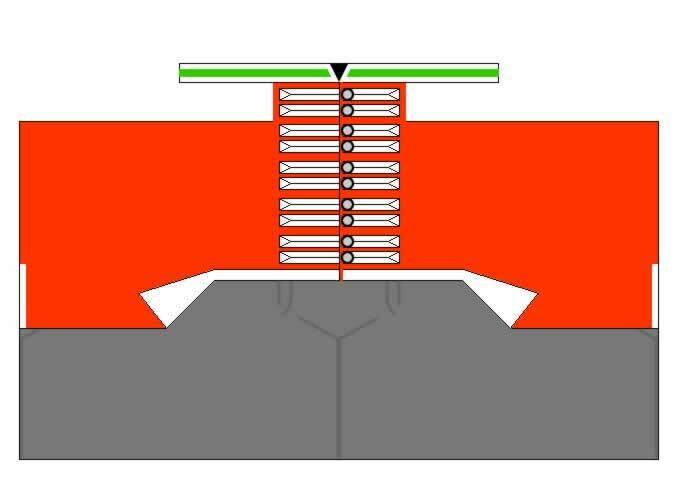 Make the print area as rectangular as possible, filling in the basic colors in printing, rather than relying on cutting out coat areas precisely. Inner cuts makes the print much more fragile (although it is more flexible), especially when wet with glue. Also, cuts have white edges, which need to be painted. The longer the edges, the more precision painting need be done, which defeats the purpose of using prints. Try to minimize the painting required for connecting the front to the back. Try to match the coat color printed to that painted. This will help camouflage the print and will minimize the desire to overpaint, which will have to be precise. Remember that some details will be covered. In the example above the cross belts on the back will be covered by a pack; the left shoulder belt will be partially covered by the cartridge box; the brown strap will be partially covered by the canteen; and so on. Shoulder straps. These could be a part of the print above, or a separate one glued on. Collar. This has some detail, plus if it is made taller than the neck of the pawn, can stand out more than one painted on. Coat turnbacks. A simple detail, but it wraps from front to back on both sides. Shako plate. These can have some detail, but more importantly are hard shapes to paint. Belgic shako frontispiece. The hard part about the Belgic shako, compared to the French shako, is its shape. At the heart it is a cylinder with a peak on front. However, the frontispiece is thin and taller than the body of the shako, so is an ideal candidate for being printed on paper. Face. Interestingly, you could draw up numerous faces and hair color combinations and print out a page of them, then glue them to the head. To get around wrinkles formed by gluing paper to the round head of the pawn you might have to drawn only the "T" of the face (eyebrows, eyes, nose, mouth, and chin), rather than an entire face. I would love to hear your ideas on this. Although I welcome comments on the blog, I prefer discussions on the Wargaming on a Budget forum (you are a member, aren't you?) as forum make better discussion platforms than blogs. Jim Walton, over on the Wargaming on a Budget forum, introduced a concept that combines the advantages of paper soldiers with the look of wooden toy soldiers. Here are a few samples of his figures, used with his kind permission. Copyright © 2010 Jim Walton. Used with permission. As you can see, Jim has printed out a figure, but wrapped it around a wooden dowel to make the figure 3D. Jim has taken the repeatability and ease of "painting" from the paper world yet attained the 3D look of the traditional figure world. Although I think this is a great idea and look, I initially did not want to junk my initial work and trade it in for this, despite the fact that I have drawn a number of such figures in the past. 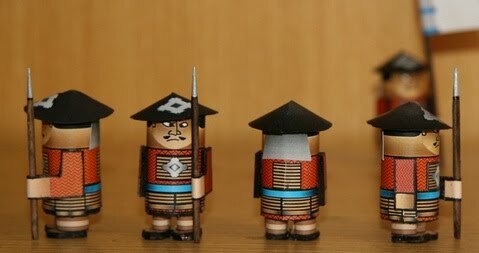 (I have a number of flat paper armies.) For one, my current system makes each figure unique. For another, it looks about like what I want it to look like. That said, there are some problems with my current system, not the least of which it takes too long to paint a unit of any size. It is great for skirmish gaming, where I might have 5 or 6 figures in the same uniform, but when the number is more like 36 to a unit, I haven't gotten it down to where I can sustain interest. Upon analysis of my painting habits, the problem is that I want certain detail, but it is very tedious to paint and take a lot of time. For example, good looking shako plates or crossbelt badges. Same with lapels, with piping and buttons. It looks great, but takes a lot of time. So, rather than "painting" the whole figure with printed paper, as Jim has done above, how about if I print out part - detail - and glue them to the figure? This would give me the detail I want, the look would be repeatable (I only want uniqueness in the face and hair, primarily), and it should save time. That will be my next experiment.